Our relationship began just before last Christmas. It started small, a bit at a time and I wasn’t sure what the outcome would be. Really it was just an idea to begin with, but somehow things grew and grew and before I knew it the whole thing seemed to have taken on a life of its own. Things did get rather hot over the summer and sharing a bed simply wasn’t an option. But, finally, last night it felt right. And so, for the first time, I snuggled down to sleep under the Masterpiece*. And very cosy it was too. I foresee many warm and happy nights thanks to my friends from around the world. * If you haven’t met the Masterpiece before (I know I’ve had a flush of new readers recently), the story starts here. It does indeed… I can’t believe, though, that it took until 7 October for it to be cold enough! Isn’t that the most wonderful thing! I loved your lead in too – knowing Mr Snail is working away all kinds of shenanigans might be going on 🙂 You will have such a cosy and snuggly winter all wrapped up in your international blanket! …and when Mr SoH gets home, there’ll be three in the bed! Seriously though, was it comfy or a tiny bit heavy? Because I was careful about the weight of the yarn used to join it and about distributing the really heavy squares, it’s great. It’s on top of quite a light duvet and the combination is just right for me on my own, although I suspect that with current temperatures it might be too warm at weekends. May you have a long, happy relationship! Thank you… I think we’re going to be very happy together over the winter! I love this! I took a look at your page that shows each story. I will be investigating that Bavarian crochet – it’s lovely! I’m planning to transfer all the stories etc to Pinerest as the ‘Masterpiece’ page has got a bit out of hand! There are already pictures on Pinterest, but not all the text… I do wish there were more hours in the day! I go away for 5/7ths of the week and look what happens!! What a happy little post. Thank you for making us all feel warm cosy and included. I am, indeed, very happy… if I can’t have Mr Snail, then a snuggly blanket is the next best thing! I will be dreaming of all my lovely bloggy friends and the new squares I might get for the ‘latecomers lap blanket’! 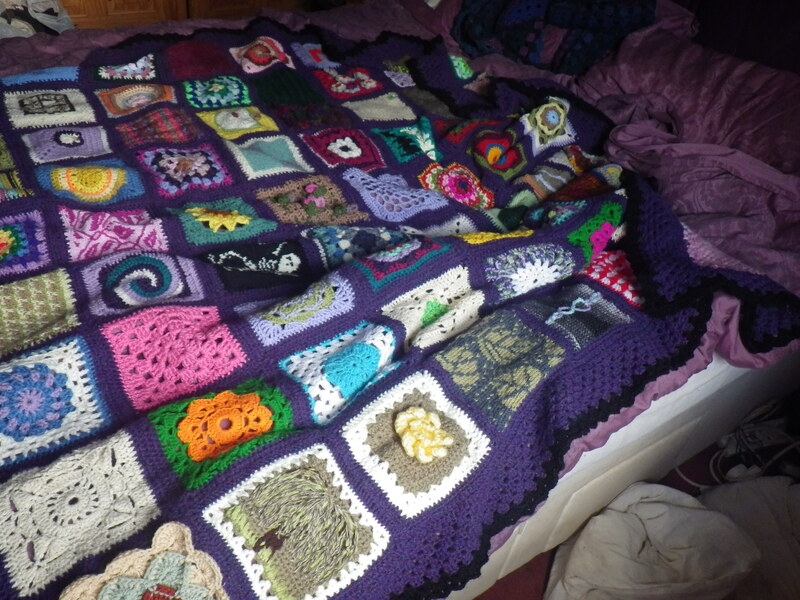 I love your blanket, such a lovely thought that the squares have all been made by people who have chosen to support you in some way. It gives a whole new meaning to the phrase ‘security blanket’. So true… I’m very taken with the idea of making connections with people in this way. If we all felt cared for by other people around the world, perhaps we’d be nicer to each other. Oh that’s lovely. 🙂 (I can see my square! I hope it kept you warm!) 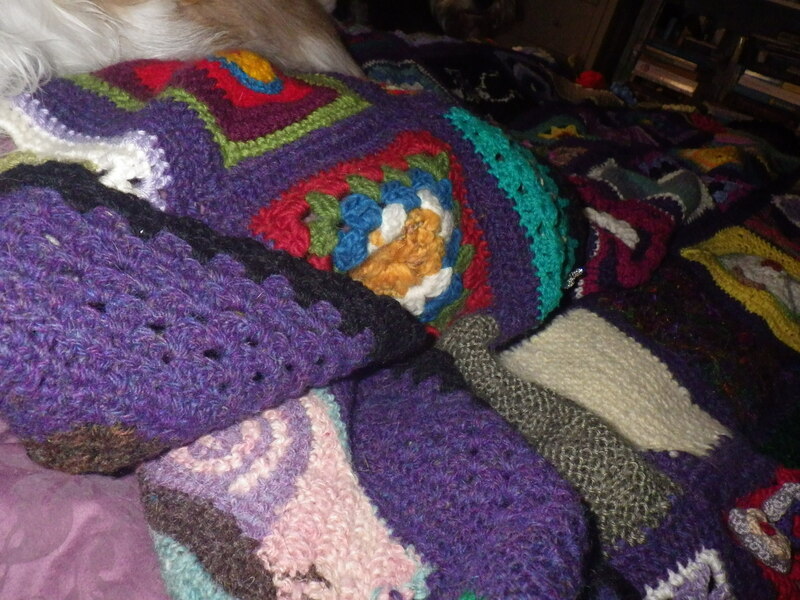 All those little gestures of knitted and crocheted friendship to keep you snug and safe at night. I know how many contributors look for their own square in the photos, so I’m trying to take pictures from a variety of angles so no one feels left out! The blanket is lovely and warm and also makes me feel emotionally warm and fuzzy! !